In 2016, the VW Beetle (Käfer) and Mercedes Benz W123 remained the top classic cars on historic H-plate registrations in Germany for cars 30 years or older. The number of classic cars on historic plates (H-Kennzeichen) increased by 11% to 343,958 automobiles. H-plates are available for cars in good, original condition and at least 30 years old. Mercedes Benz is the favorite classic car brand in Germany followed by Volkswagen and Porsche. The total number of historical cars registered in Germany on January 1, 2016, on H-plates increased by 10.7% to 343,958 cars compared to 310,694 in 2015. This is an increase of nearly 150% over the number registered in 2006. Vehicles older than 30 years in good, largely original condition may be registered on H-plates (H-Kennzeichen). These “Oldtimer” cars then often qualify for some tax and insurance reductions as well as permission to drive in many environmental zones in inner city centers. Registering a car on H-plates is optional and more common on cars that are well cared for and driven only occasionally rather than on older vehicles still in daily use. Around 75% of cars older than 30 years in Germany are using H plates. The composition of the list of the most-popular classic car brands in Germany has remained unchanged for the past three years. More than three quarters of all cars on H-plates are from the top-ten brands. Mercedes-Benz cars remained the most-common car brand with historic plates as testimony not only to the longevity of Mercedes Benz cars but also the desirability to maintain and preserve the older cars for use. In recent years, the number of historic Mercedes Benz cars was helped by the W123 cars (E-Class of the late 1970s, early 1980s) qualifying for H-plates. The W201 (190 – predecessor of the C-Class) should also give the brand a boost, although an awful number of these “Baby Benz” cars fell victim to the cash-for-clunkers scheme (Abwrackpremie) in 2009. The only real surprise on the list is that Triumph managed to cling onto tenth place and that Audi is still failing to make it onto the list. Although the number of Triumph cars on H-plates increased slightly from a year ago, the total number is still lower than in 2014. Triumph production ended in 1984 – the only of the top-ten brands no longer in existence. The VDA / KBA added for the 2016 figures the total number of cars from the specific model that are older than 30 years and registered for use on German roads. This makes it possible to calculate the percentage of cars per model that are on historic plates. For the VW Golf, only a quarter of cars older than 30 years are on H-plates and for the Opel Kadett it is just more than a third. For the classic Mercedes Benz cars from the 1960s, the percentages are above 90%. The Volkswagen Beetle (Käfer) comfortably remained Germany’s favorite classic car with nearly 50,000 still registered and of these nearly 33,000 on historic plates. VW Beetles were often heavily modified disqualifying these cars from historic plate recognition – only two-thirds are on H-plates. 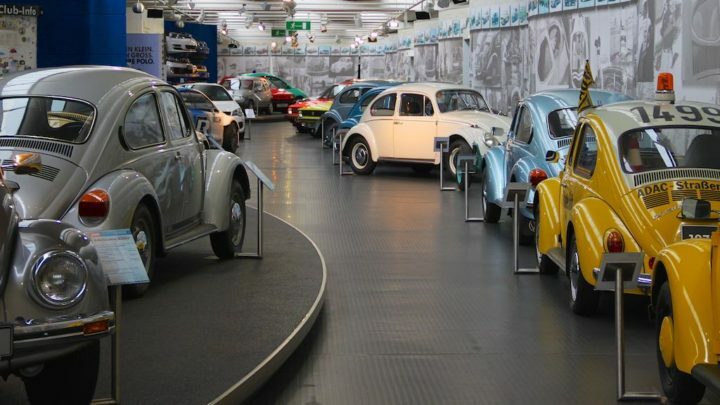 However, the Beetle is likely to maintain its top place for many years despite official sales in Germany having ended more than 30 years ago – the last officially imported Beetle to Germany from Mexico was in 1985. The Mercedes Benz W123 was in second place for the fourth consecutive year. As with the Beetle, only two-thirds of W123 cars older than 30 years are currently on H-plates. Many Mercedes Benz W123 cars – produced from 1976 to 1986 – also suffered from non-official modifications. 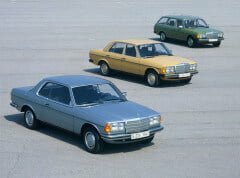 This Mercedes was the last car model to have outsold the VW Golf in Germany (in 1980). High numbers are still around and many are still likely to changed to H-plates in coming years. The last models produced in 1986 also only qualify for H-plates from next year. The Mercedes Benz SL (R107) was the second most-popular H-plate car in 2012. This version of the SL was produced from 1971 to 1989 so the number of cars qualifying should still increase further. A high 81% of R107 cars qualifying for H-plates are registered as historic vehicles. Porsche 911s older than 30 years also have a very high 85% on H-plates. With the Porsche 911 model name continuing to the present, the upwards potential for the model is high and the 911s on H-plates are likely to overtake the Mercedes SL next year. For the third year in a row, the VW Bus improved a rank position. The VW Bus, originally Type 2, has been in production in various model ranges from 1950 onwards. Only around half of the VW Buses older than 30 years are on historic plates – many were modified and other are still in commercial use. As with the Porsche 911, the model name continues to the present and many of the water-cooled cars now also qualify in addition to the classic air-cooled buses. The Mercedes Benz /8 (W114 / W115) added fewer than 90 cars to the H-plate list and slipped one rank position. The /8 is suffering more than any other top-15 model from a generation change where younger buyers have weaker emotional bonds with the model. The /8 was produced from 1968 to 1976 and is less practical than the W123 model that followed. The value of the /8 is relatively low making it often not financially worth maintaining in a roadworthy condition. 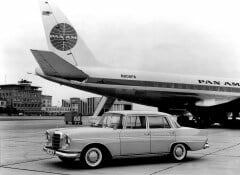 The Mercedes Benz W111 (Heckflosse) is suffering a similar fate with younger buyers less interested in this “S-Class” from the 1960s (produced from 1959 to 1965). The number on H-plates increased by only 1.1% but with nearly 90% already on historic plates, the upward potential is limited. The Mercedes Benz W113 “Pagoda” remained very popular with historic car owners – 97.5% of these cars registered in Germany are on H-plates. The Pagoda was produced from 1963 to 1971 in much higher numbers than the iconic 300 SL Gullwing and Roadster that it replaced but values are high enough to ensure the surviving cars are maintained in good condition and in expectation that values may increase in future. The VW Golf continued its meteoric rise up the ranks of historic cars. The Golf moved up only one rank position from a year ago but the number on historic plates increased by 35%. The VW Golf is the third most-common car older than 30 years on German roads but only a quarter of these cars is registered on H-plates. For many Golf owners, H-plates may bring more restrictions than benefits. However, with the Golf having been Germany’s best-selling car model since 1981, the upward potential is enormous. The Opel Kadett slipped one place into a role it was familiar with when new – behind the Golf. The Opel Kadett was produced in Germany from 1962 to 1993 but as the cheapest car on this list when new – apart from sometimes the Beetle – very few survived as oldtimers. The model name was replaced in Germany by Astra only in 1991 but the Kadett is unlikely to ever catch up with the Golf again. A strong 80% of the Mercedes Benz W116 – S-Class of the 1970s – are on historic number plates. The W116 was produced from 1972 to 1980 and was the first production car featuring ABS brakes. The car is famous for its solidity and it is high fuel consumption rather than longevity issues that keep many off the road. The Mercedes Benz W108 / W109, which preceded the W116, has an even higher 92% of surviving cars on H-plates. These cars were produced from 1965 to 1972 and in Germany, only 290 survivors are not yet on H-plates. The Alfa Romeo Spider jumped two places after the number registered on H-plates jumped by 25% since 2015. The Spider was produced until the early 1990s so more may qualify for H-plates in coming years, although rust often got to the Alfa first. The Italian Alfa Spider is the only non-German car on the top-15 list although Fiat, Alfa Romeo, GM and Triumph are all on the top-ten list of brands while Audi is not. Although around 10 million Opel Rekords were produced and sold in Germany over 10 generations from 1953 to 1986, fewer than 9,000 are still registered for use in Germany. Of these, less than 40% are on historic number plates. 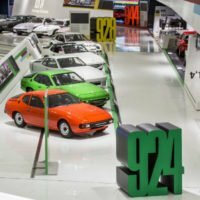 A new entrant on the top-15 list of most-popular historic cars in Germany is the Porsche 924/944 that entered the list at the expense of the BMW Baureihe 02. These sport cars were produced from 1976 to 1991 and in recent years experienced an increase in popularity amongst classic car buyers. The number of Porsche 924/944 registered on H-plates increased by near 60% in the past year alone and with the high propensity of Porsche owners to add their cars to the historical register, the second Porsche model is likely to stay on the top-15 list.